Gen. 6 Marriage of Charles Byrne of Sleaty to Julia Kinselagh of Ballin, Co. Carlow. 1803. 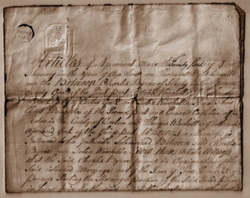 Charles , the only son of Gerald, married Julia in 1803 , the Marriage Settlement Deed shown here sets out in detail all of the financial conditions and the provisions if the marriage broke up and when either party died. Charles was known to be " the best brandy drinker in the Kingdom "
He died in Boulonge, France at the age of 40. They had issue of 3 sons and 3 daughters. Both are commemorated on Gerald's Memorial Stone in Sleaty Graveyard. Original document in the library of Val Byrne.